With Richard Kock and Robyn Alders I co-authored the following review of food and forest crises. Richard presented an earlier version at the World Organization for Animal Health (OIE) Global Conference on Wildlife held in Paris in February. Over the next few days we will publish three slightly edited excerpts. The past is more than prologue, setting the very paths on which subsequent circumstances contingently emerge. It also actively exists, albeit in a modified form, in the structures and processes we find ourselves a part of today. Within such a framework we will argue here that solving the ongoing food security crisis in the coming decades requires reflecting back on agriculture’s role in human history and identifying key events and factors that have led to, and continue to drive, the current challenges. How far back should such a review extend? Because of the complexity and scope of the present crises, we begin with our species’ origins. Humans evolved as nomadic hunters dependent on wild herbivores, vegetables and fruit, and benefiting from a rich and nutritious diet. The first recognizable humans evolved around 1.8 million years ago as Homo erectus. The period saw a diversification in our lineage, from intelligent, tool-using apes to upright, bipedal walking hominins. The archaeological record supports the hypothesis pre-hominins adapted to an increasingly terrestrial lifestyle marked by hunting and tool use sophisticated enough to remove meat from bone. The tools were probably wooden to begin with, replaced by stone tools by about 2.4 million years ago. Damage marks on fossil bones in Ethiopia are consistent with tool development in the region at the time. The cultural adaptations enabled an ecological generalization at a time of climatic variability and, along with increased brain size and tooth development, a more varied diet. In the context of these drivers Homo sapiens evolved. Grazing herbivores emerged alongside, colonizing C4 grasslands which evolved in tropical biomes during the late Neogene period ending 2.6 million years ago. This new animal and plant community provided the substrate on which an upright, agile human being capable of long distance running first evolved. The ability to hunt migratory animals for food selected for long-range nomadism. The new mobility increased human home ranges, allowing the species to expand into new lands, and distributing hominins across Africa, Asia, and eventually the Americas and Oceania. Agriculture was not just a bright idea but a necessity for a growing population of humans forced on overhunting to scavenge for food. A fundamental change in the fortunes of the human species occurred some 10,000 years ago. There was a gradual shift in communities away from nomadic hunting, with its high-quality protein diet and nutritious wild vegetable-like plants, to cultivating a broad spectrum of what were then lower quality food types. This increasing sedentism took place over some 7000 years. The switch was the result of neither some sudden brainwave or upsurge in intrinsic intelligence, nor a passing preference for sedentary lifestyles. Agriculture most likely arose by necessity as overhunted megafauna became relatively scarce. A more efficient use of space and time proved a benefit of such a sedentary lifestyle, leading to widespread experimentation with plants and ultimately the domestication of staple crops and animals. These changes inevitably led to profound modifications of the landscape, an intensification of plant and animal management, and a fundamental change in the evolutionary drivers under which humans were forced to again respond, as evidenced by a shift away from tall, agile physiques to shorter, more muscular bodies fit for digging and hauling. Cultural change, housing, and more diverse livelihoods followed. It is often assumed that agriculture immediately resulted in improved nutrition and increases in reproduction and growth rates, but there is good evidence, supported by paleopathology, to suggest that mortality rates increased with more sedentary lifestyles, by way of, among other causes, exposures to new infectious diseases and nutritional deficiency, especially amongst children and the elderly (here and here). There was, however, eventually a net increase in the Neolithic human population, albeit small, at about 0.1% per year, ascribed to reducing birthing intervals and increasing fertility. As the population slowly grew and expanded, attendant increases in average family sizes were accompanied by an expansion in demand for food and better nutrition. The gradual adoption of a broad-spectrum diet, agriculture, storage, and sedentism mitigated seasonal shortages, and gradually, as productivity improved, life expectancy increased. We see, then, wild food progressively replaced by agriculture as a contingent response to scarcity. If early humans had practiced a more sustainable resource utilization, the agricultural path on which we find ourselves, so seemingly integral to our identity as a species, might never have been followed in quite the way it was, if at all. Men make their own history, but they do not make it just as they please; they do not make it under circumstances chosen by themselves, but under circumstances directly encountered, given and transmitted from the past. These choices, dating thousands of years, remain active in our present landscapes; by directing subsequent choices, but also as previous practices and structures remain in active use, although, obviously, in now modified forms. We contend that understanding the historical roots of present-day food systems—embodied today in a place’s agro-ecological ‘historical present’—is critical to finding solutions to emerging challenges both globally and at any one locality. The Industrial Revolution produced another fundamental shift in the food regime. Once humans learned how to domesticate plants and animals, they achieved a reasonably secure life in many different settings and climates. 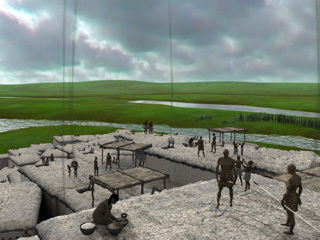 A new balance was struck with nature and the resulting post-Neolithic populations remained relatively stable globally for three millennia, despite the odd extirpation, up until about three centuries ago. A considerable diversity of livelihoods, ethnicities, and cultures emerged alongside a remnant of hunter-gatherers. Modern rural societies comprised sophisticated livestock keepers (some nomadic), agricultural communities, and crafts and trades people. Towns and cities developed on settlement sites, usually river courses, ironically enough on some of the richest soils, which would soon disappear under buildings and rubble. Goods and people were transported over considerable distances, reducing the risks of local crop failure and food shortages. A market culture emerged. People increasingly became preoccupied with war, intellectual pursuits, religion, culture, technology and consumptive materialism. Most humans just a century ago still moved no more than a few tens of miles from their birthplace during their lives. People were as a result likely extremely sensitive to ecological processes and seasons, as their food remained largely locally derived. The relationship between mind and place soon changed. Science, transport, and plant and animal breeding led to massive increases in the movement in people and products, and in food potential in both diversity and distance. Along with rapidly improving medical technologies and, eventually, public health, newly emergent globalizing cultural complexes led to improving survival rates for some populations (and, at the same time, for the most exploited populations extirpation by war and dispossession). With industrialization, humanity entered a period of exponential growth, concentrating in cities, and increasingly losing an intuitive grasp of the ecological processes that sustained early food production. The human population took some of its most dramatic turns starting only 60-70 years ago, although the groundwork had been laid down through the 18th and 19th centuries. Agricultural and industrial development tied to capital accumulation contributed to a rapidly evolving cycle of human population growth and expansion, forcing greater innovation in agricultural and industrial methods, increasing settlement, population concentration and changes in the landscape. Do we suffer the illusion of an inevitable existence? To this day, and at great risk, we remain participants in this particular paradigm. Human society appears to act as if it is oblivious to the accumulating threats resulting from the present cultural trajectory. Natural systems are now considered primitive, uncivilized, or simply a distal resource for exploitation, to be supplanted in due course by modern, superior manmade ecosystems and synthesized products. Industries continue to feed off abundant (and cheapened) labor, wealth accrues, and a reified divine right to exploit Earth’s resources dominates thinking. The ethos appears rooted in the fact of our continued existence. Human populations, after all, were repeatedly able to overcome food and other apparent resource limitations. The fallacy of an inevitable existence is refuted, however, by the dead civilizations strewn across the globe’s archaeological strata. The precariousness of our situation is all too apparent in current affairs. Science and human ingenuity have resolved one food security crisis after another for the most part on local scales alone and often by shifting food surpluses to reduce famine. But the crises appear to multiply and the options to resolve them are dwindling in number and scope as ecosystem resilience declines and productivity is threatened by still greater production rooted in the assumptions of neoclassical economic theory. We have stepped over the green line—an ecological tipping point—and are dipping deeply into all of Earth’s assets. In a blink of a geological eye, habitat destruction, biodiversity loss, ecological dysfunction (and attendant increases in disease emergence), resource depletion, soil degradation, pollution, peak energy and climate change have hit home together, coincident with a hubristic celebration of the remarkable scientific achievements of the past few decades. The collapse of ancient civilizations may well have felt something along these lines. Seemingly hopeless, survivors of a lost golden era must have thought the world was coming to an end, even as out of these collapses new civilizations eventually emerged. We face, however, a complex of problems orders of magnitude greater in their difficulty. Globalization—geological in its scope, leaving us nowhere to run—has so changed the conditions under which humans relate to, or are alienated from, their environment that, a single civilization now, we are confronted with a make-or-break proposition of our own undoing. The resulting damage may be too complete. History may offer us many collapses our species has survived, but these, whatever their number, can offer no sample sufficiently representative for guaranteeing the security of our future. On a finer time scale, prospects look dim. The ‘abundance bubble’ is burst. An entrenched global financial crisis, coincidental with dramatic spikes in food prices in 2008 and again this year, is pushing us towards another fundamental shift in our food regime, one that, cycling back, may in due course produce the conditions that lead to its own demise. While previously we could stutter step from one food regime to another, we are reaching an absolute global carrying capacity that precludes merely expanding capacity, which until now, via land grabs and export economies, came at the cost of deflating the carrying capacity for those in the global South with little access to the markets they supplied. The majority of the human population now lives in cities, seeing the natural world through television screens and computers. They have until now been largely absolved of the more immediate environmental concerns by way of large, but transiently available supplies of energy, food and shelter. Nature and wild food are treated as a thing of the past and modern food a commodity whose origins reach no further back than the supermarket shelf. A terrific world in some minds perhaps but a fragile one as empty shelves, as they frequently appear, are more likely to inspire political revolution, as demonstrated this year, than any return to the plow. Political disturbances that arise from such internal contradictions can manifest from external perturbations of the most unexpected sort. When disasters cut globalized supply lines, thousands, even millions, are forced to queue up for hand-outs governments and humanitarian groups are often unable to expediently deliver, if at all. In March Japan suffered its worst earthquake and tsunami in two centuries, and a subsequent nuclear disaster which contaminated food and water supplies over hundreds of kilometers. Large portions of one of the most technologically advanced societies on Earth lay wrecked, a warning to us all. Given social and ecological trends, with sharply detrimental turns the past decade, it appears high time we question the fundamental tenets of technologically driven economies and a consumption-based capitalism that both produces and depends on cheap labor pressed up against ecological limits. As our species’ history shows, when needed, paradigm shifts in both concept and practice are essential to our survival. Collapse–and an irresistible forest–followed those civilizations that were unable or unwilling to change. This entry was posted on April 6, 2011 at 6:29 am and is filed under Ecological resilience, Evolution, Sustainable farming with tags agriculture, domestication, food security, globalilzation, historical present, hominins, landscape, nomadism, tipping point. You can follow any responses to this entry through the RSS 2.0 feed. You can leave a response, or trackback from your own site.